Provide comfort for the family of Arbury Cochran with a meaningful gesture of sympathy. Arbury (Arby) Dean Cochran, age 83, of Joplin, passed away on Wednesday, January 30, 2019 at Spring River Christian Village in Joplin following a lengthy battle with cancer. 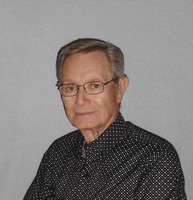 Mr. Cochran, son of the late Norman and Oleva (Cantrell) Cochran, was born on September 13, 1935 in Miller, Mo. While attending Sarcoxie High School, Arby worked as a cook for Boots Drive-Inn, Carthage, Mo. With his earnings, in 1950, he purchased his first car before being old enough to drive. It was a 1936 Ford, decked out with mud-flaps, a multi-colored squirrel's tail, a steering wheel knob, and wide white walls. After graduation Arbury was employed at Leggett & Platt and Eagle Picher. He found his niche when he was hired as a salesman for new cars at the Ford Dealership in Columbus, Kansas. He continued in car sales at McDonough Volkswagen/Mazda, in Joplin until his retirement. In 1953 Arbury joined the Army National Guard and served in the 135th tank battalion until 1961. "Back in the day" as he would say, Arby did enjoy riding motorcycles and drag racing cars with his friends in Asbury. He loved playing fast-pitch softball and was the pitcher for the Carl Junction Christian Church ball team. As a member of the Bethel Assembly Church of God, he loved participating in their special music, singing solos and duets with Ken and others also playing the trumpet and several different harmonicas. Arbury is survived by his four sons, Terry Cochran (Mary) of Springfield, MO., Brian Cochran (Pam) of Arlington, IN., Jeff Cochran (Tracy) of Gardner, KS., and Corey Cochran of Lantana, TX; Arbury is also survived by former wife and forever friend, Rosie York of Lenexa, KS; one brother, Gordon Cochran (Becky) of Joplin, two sisters, Beverley Cochran, of Ozark, MO., Norma Hilberg (Lance) of Michigan City, IN; twenty grandchildren; 16 great-grandchildren, with another on the way; and several nieces and nephews. Funeral services will be held at 2:00 p.m. Tuesday, February 5, at Mason-Woodard Mortuary in Joplin with burial to follow at Harvey Cemetery, LaRussell, MO. The family will receive friends on Tuesday, February 5th. starting at 1:00 p.m. until service time at the mortuary. Memorial donations may be made to the Christian Church of Carl Junction and may be entrusted to the mortuary. We, Arbury's family, would like to say that Arby was an example of kindness and so very generous with his time in helping family and friends in whatever their needs might be. Believing that "prayer is a powerful weapon" he was a prayer warrior for all. He was a blessing to us and in turn he was very blessed by the kind and wonderful care that he received from the nurses and aids at Spring River Christian Village and the special loving care that Arby received from Avalon Hospice. Thank you all. A special "Thank You" to Mr. and Mrs. Ken Masterson. Thank you Margaret for being the pianist and to Ken for being a coffee buddy and friend to the very end. To send flowers in memory of Arbury Cochran, please visit our Heartfelt Sympathies Store. We encourage you to share your most beloved memories of Arbury here, so that the family and other loved ones can always see it. You can upload cherished photographs, or share your favorite stories, and can even comment on those shared by others.